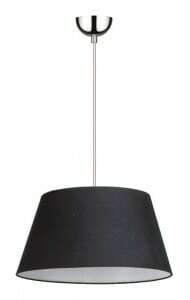 Thank you for submitting your question about Black Clark E27 60W floor lamp. Floor lamp in black, made of fabric, metal and marble, which thanks to its originality will look at each other during family gatherings. Modern luminaires , unmatched in their simplicity, are also very durable and economical. Among all the rooms of the house, the featured product will be attractive in the bedroom, living room or office. The luminaire allows the use of 1 light source with E27 socket and a maximum power of 60 W. Lamp height: 1750 mm, width: 500 mm.